Surprise! Bush’s vilified education law works. Durant-Tuuri-Mott (DTM) Elementary School in Flint, Michigan, is exactly the kind of place that reformers had in mind when they crafted President Bush’s No Child Left Behind (NCLB) Act in 2001. The facility is in obvious disrepair; eight out of ten students, most of whom are African American, qualify for federal free lunches. On a visit to the school, I once saw a bulletin board displaying essays on the topic “I’ll never forget when... .” One student wrote about the time “my stepdad had come to say hey! He had a weopen in his back pocket. He almost hit my mom with the wepen but she moved. ... My mom called the police out and he got rasted for saying the wrong thing.” Another recalled the day “my brother died. ... He got shot in the stomach with a gun. I keep him in my heart for a long time.” A half-dozen other essays described murders, although a teacher later confided some kids might have invented stories to impress their peers. My first encounter with DTM came a few years ago, after reading a study on whether Flint’s schools were living up to the standards set by NCLB. The law applies a series of sanctions, possibly culminating in closure, to schools where students don’t show enough “Adequate Yearly Progress” on statewide, standardized tests. After NCLB’s first year, most elementary schools in the famously troubled Flint failed to meet the standard. By 2005, however, scores had improved so much that all but one were no longer in danger of sanctions. I approached the district to investigate, and they sent me to DTM, which in 2006 won a Bush administration award for its dramatic turnaround. The hype made me skeptical, given everything I’d heard about NCLB: that it stifled teacher creativity; that it taught kids how to take standardized tests, rather than read, write, or do math; that it increased demands on schools without increasing funding; that it would punish educators for circumstances beyond their control. 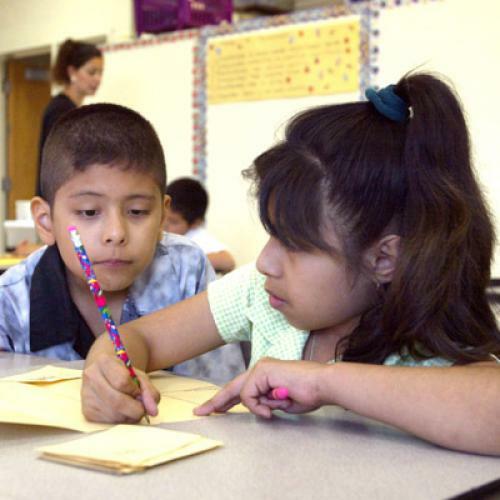 Today, as NCLB awaits reauthorization by Congress, those critiques still resonate. Even President Obama, who has advocated tough performance standards for schools, called for replacing the law in his State of the Union address. After observing DTM sporadically over the last three years, however, I have new doubts about these criticisms. NCLB’s vision of school reform may be blinkered, and a school like DTM owes its success as much to its gifted staff as it does to any outside force. But, as even those educators admit, NCLB changed the way they taught and led them to reach some of the children who might have otherwise fallen behind. And while DTM is just one school, the academic literature suggests its experience may not be unusual. To be clear, DTM was never truly a “failing” school. Based in part on its reputation for good teaching, it was attracting transfers from elsewhere in Flint even before NCLB. (Michigan was an early adopter of school choice.) The credit for that, according to virtually everybody I’ve interviewed, begins with Dan Berezny, DTM’s principal since 1992. Berezny has a reputation for diligence—“he even cleans up puke,” says Karen Lozon, the school’s parent coordinator. He recruited much of the present faculty, seeking overachievers like himself. Among his innovations was “lunch and learn,” which takes kids out of the cafeteria (and lunchtime fights) and gets them to work on enrichment activities while eating. During my many walks through the school, which Berezny let me do unsupervised, I almost always saw the teachers actively teaching, not just presiding over quiet work time. So why didn’t the kids do better on those initial NCLB results? Like most Flint schools, DTM had federally funded “intervention” specialists to help the neediest students. Before NCLB, teachers would typically request these specialists based largely on haphazard, in-class observations. After the law passed, the district required DTM, along with Flint’s other schools, to test student aptitude and achievement more thoroughly—and to do so earlier in the year. This enabled teachers to identify the neediest students in time to improve their scores by the end of the year. Remedies can be as simple as a teacher revisiting fractions with a fourth-grader—or as complex as administrators convening meetings with parents, counselors, and the intervention specialists to plan intensive instruction. “The difference now is that we are identifying the kids through data,” says Berezny. The poor test results highlighted another problem: Kids were changing schools multiple times; in a given year, about one-third of the students ended up in different schools. Because the district curriculum was vague, these kids duplicated some lessons and missed others. So, two years ago, the district introduced a more specific curriculum, to be adhered to in sequence and on time. Many teachers resented the loss of autonomy, but there’s widespread agreement that the new system is an improvement. “More people are teaching to the benchmarks and standards they need to hit, not just what their expertise is,” says Linda Koory, the assistant principal. Of course, for every good thing DTM staff had to say about NCLB, they had something bad to say about it, too. “They put a lot of requirements in No Child,” says Berezny, “but they didn’t put a lot of money with it.” Most of the school’s equipment looks at least 30 years old, apart from some computers and high-tech white boards purchased with one-off funds from the Recovery Act. Worse, chronic budget struggles mean teachers frequently face transfers and layoffs. Not every school has instructors as dedicated as Berezny and his staff. But there is evidence that NCLB has had a positive impact overall. A nationwide study published last year by the National Bureau of Economic Research showed that NCLB had led to “substantial and almost universal gains in math”—a result consistent with previous research. The study also had some discouraging news: Reading scores hadn’t improved. The authors speculated that this was because reading development depends more on parental involvement and other factors outside the classroom. But that’s not an indictment of the law so much as a reminder that, at best, it’s just one piece of a strategy to improve education for the kids that need it most. Jonathan Cohn is a senior editor for The New Republic. This article ran in the March 3, 2011, issue of the magazine.